Five minute fiction for less than a fin. "A naked woman with a gun can be a lot less interesting than you’d think. When the gun is pointed at you. And when the lady in question — as lovely as she is with high, pointed breasts, razor-sharp hipbones, and knee dimples cuter than Minnie Mouse— has killed twice before, without pause, without guilt." 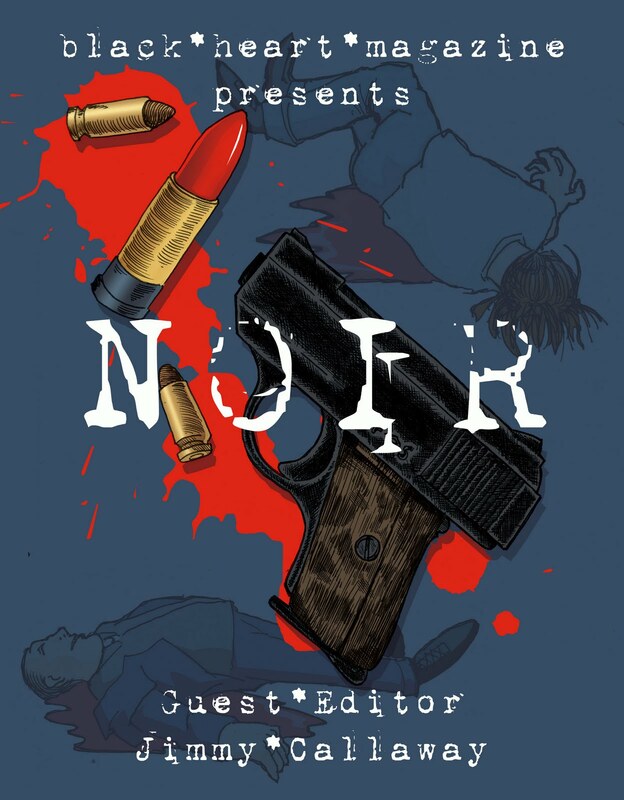 So begins Monkey in a Barrel by Richie Narvaez, one of the contributors and one of the stories in Black Heart Magazine's The Noir Issue published by Smashwords. A blend of short fiction and shorter poetry set in the seamy underbelly of a time and place near you. The Noir Issue evokes Chandler, Hammett, their private dicks and girls gone wrong. Hell, even Keroauc's Dean Moriarty makes an appearance as two characters - Dean and Moriarty - who are looking to hit the road in Matthew C. Funk's From Death Trip to Road Trip. These five minute reads are perfect reading while waiting for the next train. The Noir Issue bring together the talents of 27 rising nouveau crime authors and visual artists in 25 chapters of graphic squalor and ambivalence. Who's been wronged? Who's gone missing? And who's just seen too many dead bodies? It won't take you long to get to the answers in these lyrical crime scene photos - the stories end while you are still blinded by the flash bulb. Unleash your inner Elmore Leonard or John D. MacDonald by submitting your contribution to the genre. Black Heart Magazine has been publishing new fiction on a weekly basis since 2008. Black Heart also publishes poetry and reviews if that is the darkened alley that you choose to walk down. You can't go wrong for less than a fin. At $2.99 The Noir Issue is cheaper than a shot of Jim Beam at happy hour.